If you had an abandoned school bus at your disposal, what would you do with it? Strip the paint and turn it into a stationary food truck? I'm not sure if they necessarily had meant to operate out of a school bus but Okina Cafe rocks it pretty well now. 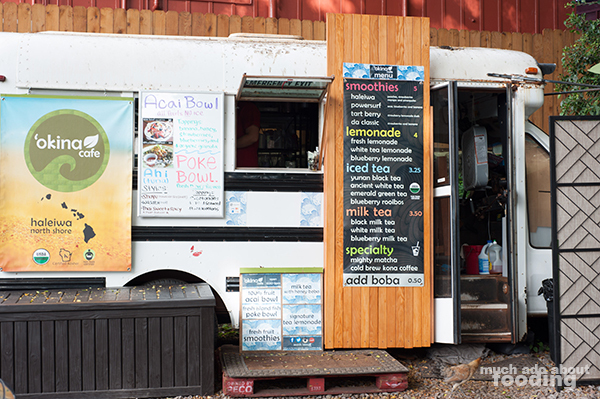 We came across this cute little spot while stopping by a shrimp truck gathering at the North Shore in Oahu. When you've got your fill of tasty, sometimes salty seafood, you might find yourself craving drink; this spot's got your back. The easy to read sign with just a handful of options in addition to signs indicating their commitment to organic drew us in, and we were glad for it. The original idea was to just grab two cups of milk tea and head out. Instead, Duc found himself talking a little bit with the owner about tea itself. 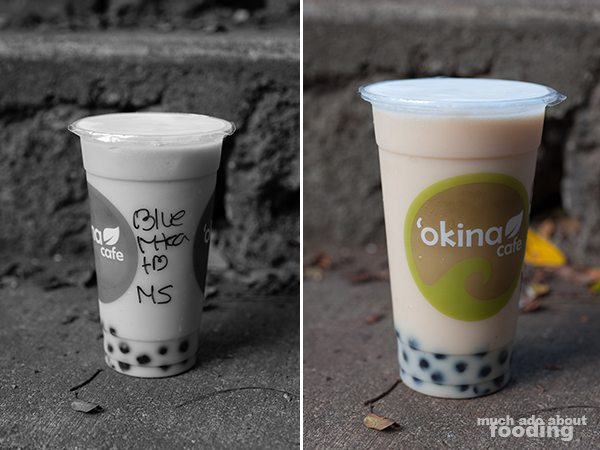 Their milk tea options are just three - white tea, black tea, and blueberry milk tea. I had asked him to inquire if the only difference between the white and black was that they used white tea and black tea while making the milk tea (instead of those being names for "flavors" they chose). Instead of a short yes or no answer, they gave us a more detailed explanation of the tea harvesting processing and the way that different stages of tea leaf life contributes to the type of tea made. That to me meant that they must know their stuff! Not only that, the people were friendly and helpful. If only their imported matcha tea was available! It sounded like a good option too, and their ability to sell out of it daily is a tribute to the quality. Instead, we left with just their White Tea ($3.50) and Blueberry Milk Tea ($3.50) with the additions of honey boba. 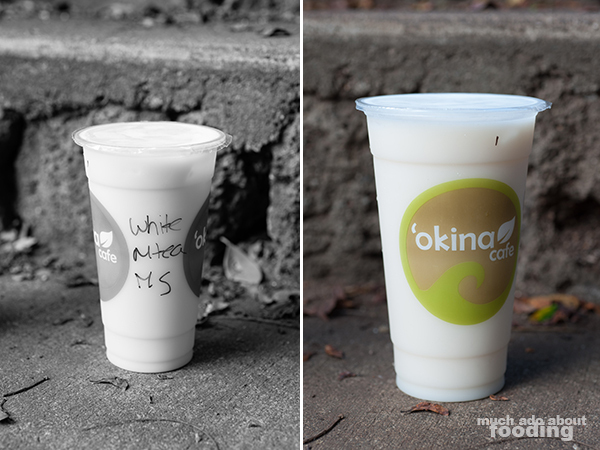 If you are seeking out a sugary, creamy drinks, you won't find that in these milk teas. They are not made from powder nor are they made in one generic taste. The teas are carefully brewed and the milk part just subtle, giving the feeling of smoothness but without any overbearing heavy cream component. It mainly tasted like tea! The boba was slightly sweet from its honey base but unfortunately a tad harder than we would have liked in the center. Overall, it's a good spot to stop by if you want some genuine tea from some genuine people.